Jack in the Box has some good news. 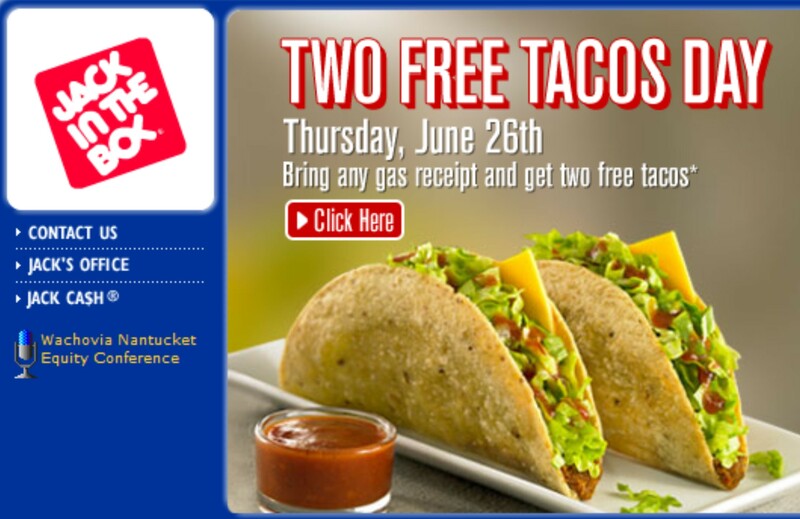 On Thursday, June 26th, all you need is to bring a gas receipt to any Jack in the Box and they’ll give you two free tacos. Check out http://www.jackinthebox.com/twofreetacosday/ for more information and a message from Jack himself. 5. You can’t remember if is pot illegal. 8. You can’t remember is pot illegal? 11. Unlike back home, the guy at 8:30 am at Starbucks wearing a baseball cap and sunglasses who looks like George Clooney… really IS George Clooney. 13. You can’t remember… is pot illegal? 20. If you drive illegally, they take your driver’s license. If you’re here illegally, they’ll give you one.